Our rates are for double occupancy. We pro-rate room rates for a single guest (less $10) and for a third guest (plus $25) in a room, please inquire. Rates are different for each room reflecting the amenities. All rooms have private bathrooms with showers. Because of the increased demand for lodging during the prime vacation months, July & August, the sooner you confirm reservations the better your chance to gain a desired date and particular room. Rates and rooms are subject to change and availability. 11.7% rooms tax is additional. Breakfast is included. 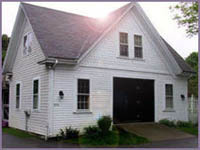 The separate, second level, apartment suite in the Carriage House is rented by the week, May through October. It is also available off-season for short or long term rental. It has 2 bedrooms and 2 bathrooms, a pull-out couch, a fully equipped kitchen, a living/dining room and sleeps 7 people. No daily maid service or breakfast included. Private quarters and fully furnished. Private cottage with a side yard, located at the back of the property. Available weekly during May through October and available off-season for short or long term rental. This 3 bedroom cottage has 3 bathrooms, a fully equipped kitchen and a living/dining room. It will sleep 7 people. Daily maid service and breakfast are not included. Private and fully furnished. Cancellations: With a cancelled reservation less than 1 week prior to arrival, there will be $100 cancellation fee. Children: There are limited accommodations for children under 6 years. 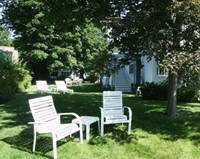 Summer Reservation Minimums: Two nights stay requested in July and August. Three nights are requested on Holiday Weekends: Memorial Day, 4th of July, Labor Day & Columbus Day. Discounts: Stays of 5 or more days are discounted 5%. Family rates available. Please inquire. Deposit: Credit card information is needed to secure your reservation. Payment: Credit Cards (VISA, MasterCard, AMEX, Discover), checks and cash are accepted. 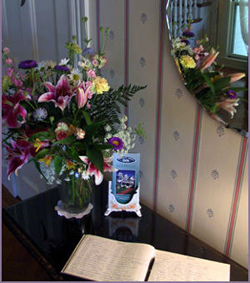 Gift Certificates: Pleasant Street Inn gift certificates are available for $175. Please inquire. Non-Smoking Policy: This is for the comfort & safety of all of ourguests. Pets: Sorry, we do not accommodate pets.